1. The url displayed when you are logged into your Lightspeed web portal. 2. The administrator email used to login to your Lightspeed web portal. Once we receive that information we will reach out with next steps. 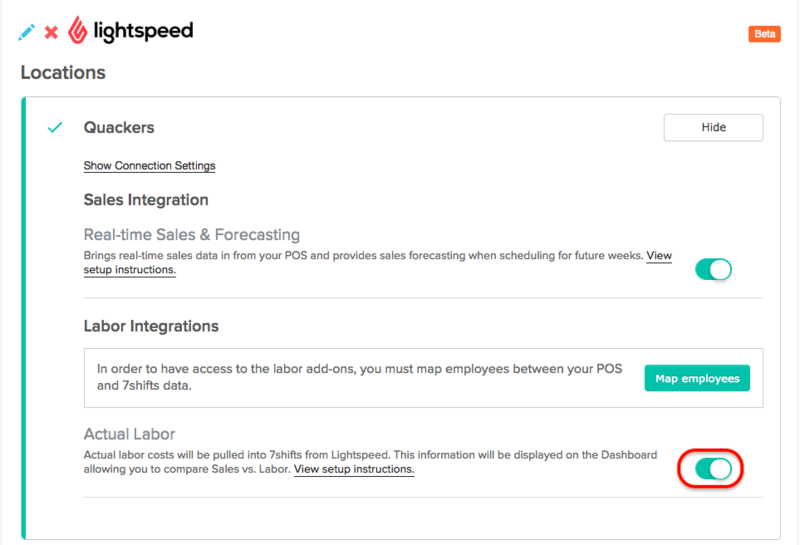 You can link your Lightspeed POS with 7shifts to provide accurate sales forecasting when building schedules. This allows for more accurate scheduling if you're wanting to stay on budget and within your labor target percentage. 7shifts will also show you in real-time what your actual sales are. The Actual Sales row will initially be empty until sales start rolling in. Once the sales numbers have been pulled in to 7shifts, they will be shown appropriately under the specific day. Now when you go to build schedules for future weeks, 7shifts will automatically look at past historical sales and insert sales projections for you. We integrate with Lightspeed actual labor which means your actual labor costs will be pulled into 7shifts. Once enabled, this data will be displayed on the Dashboard allowing you to compare Sales vs. Labor. Click 'Map Employees' to map your Employees between Lightspeed and 7shifts. For unmatched employees, you can either match up, ignore, or create the employee. Please review all matched employees before clicking 'Save'. If an incorrect match was made, you can always correct the mistake by clicking 'unmatch'. The employee will now be listed under 'Unmatched' and you can assign them correctly from there. After clicking 'Save', it can take up to 3 hours to finish syncing. Click the slider button to enable your Actual Labor at the bottom right corner of your screen. You'll see the Actual Labor numbers update on the Dashboard on the day you enabled Lightspeed Actual Labor. Going forward, these numbers will be updated daily from Lightspeed.